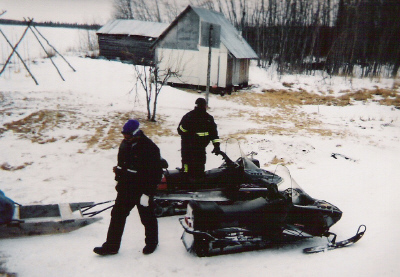 In February, 2004, the gate for the execute phase of the Crow Village imitative named Project Caribou was reached. The project had spent more then a year in the front end loading portion, and was marked by one re-cycle into the select phase due to risks noted in the Technical Infrastructure Plan (TIP) that had not been sufficiently mitigated. This document details the learning's from that execute phase. It should be noted that the project has once again cycled to the select phase since one of the major deliverables was not met due to constraints on supply. It is estimated the project will reach the execute phase once again in February of 2005. So while there is no longer any hope of delivering the project on time, the effort is still under budget thanks to strict adherence to Crow Village Process (CVP) methodology. 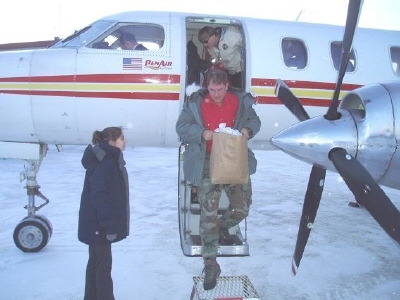 Russ White, Joe Higgs, and Uncle Tom were the 3 visitors from Anchorage, lured by the potential access to the Mulchatna caribou herd - the Alaska's second largest at over 200,000. The first day was a staging day. 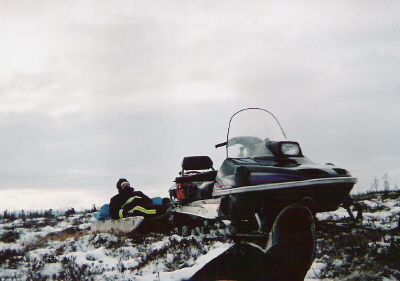 There were some mechanical issues with a few of the snowmobiles that had to be dealt with prior to the undertaking of any substantial transportation ventures. 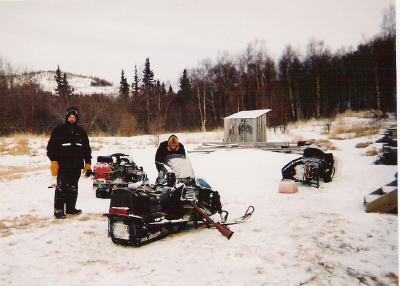 Shop was set up in front of the Aniak lodge, and the maintenance work commenced. Innovative procedures were incorporated, and occasional advice was obtained from a local subject matter expert who was moonlighting that day as a commercial airlines customer service representative. Sufficient repairs were made to bring the total number of transportation units to 3. The expertise of the technicians was such that consultation of the technical documentation was not even required. With the transportation issues sorted, a scouting expedition was arranged. 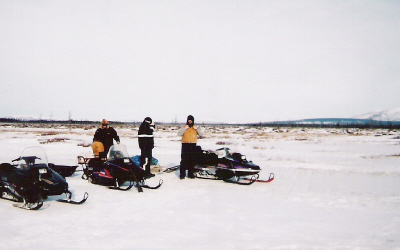 Lisa served as the guide for the expedition which followed the Aniak Slough to the "cat trail" and out to the "Y" on K300 trail on the tundra. Plenty of caribou sign was observed, and the guide even reported a possible sighting, however that sighting was never independently confirmed. It was noted for future reference that the surface consistency of the cat trail was less then optimal. 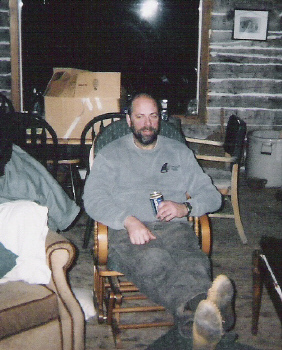 The day concluded at Crow Village where the fire was stoked, dinner was cooked, sleeping arrangements were sorted, and planning commenced whilst enjoying refreshing beverages imported into Crow Village by the visitors from Anchorage. The next day, hunting commenced in earnest. 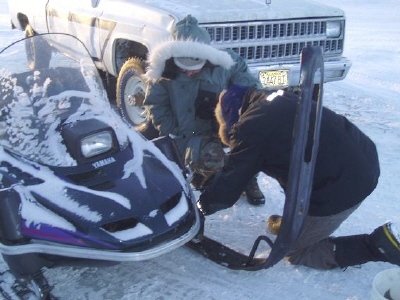 A fueling stop was made in Aniak, followed by a journey out the cat trail again, and a large loop was completed around the tundra terminating at the cat trail trailhead. Some portions of this tundra were characterized by the hunters as rugged - a condition that could have been rectified by some additional precipitation, but the precipitation never occurred in measurable quantities. In fact, Joe was heard to comment on several occasions "YEOW"! (translation - gee, I think you may have gone over that bump a bit too fast for my optimal comfort level). 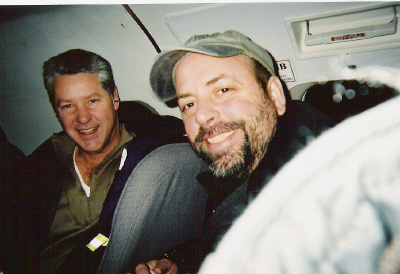 The navigational expertise of David and Dakota was supplemented by additional information observed by the GPS unit Russ brought with him. 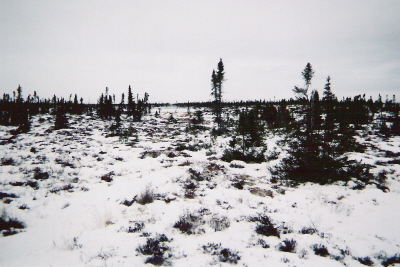 Once again, much evidence of caribou activity was noted, but none of the critters were actually spotted. A mechanical issue developed on one of the sleds by the end of the day rendering it useless for the remainder of the visit. Scouting information obtained by Lisa from Uppa Ray was utilized in the routing decisions for the second day of hunting. 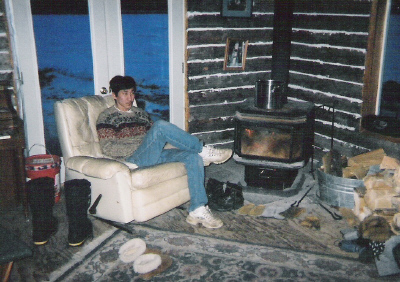 Data suggested that the caribou could be found in the vicinity of a cabin along the discovery creek. 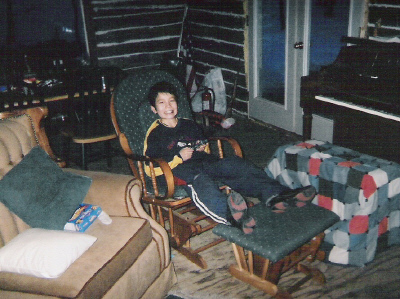 With only 2 snowmobiles available, the riders had to double up, and Dakota was left behind. The route brought our voyagers downstream from Crow Village and then up the Aniak Slough to the Brown Bear Slough, and then cutting across some wooded areas and then out onto the tundra. A loop was followed across Whitefish Lake and then returning back via the cat trail. The results were similar to the first day. The day was finished by cutting a hole in the ice in front of Crow Village to facilitate gathering of sufficient supplies of water. 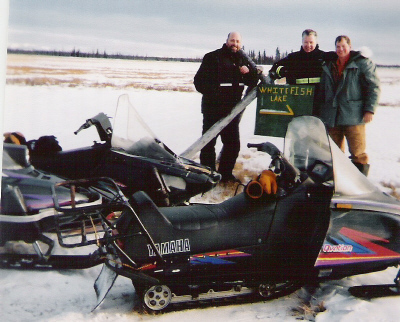 The route taken for the third day of hunting went through Aniak to the cat trail and then across Whitefish Lake and returning via Discovery Creek. Once again, no caribou were found. 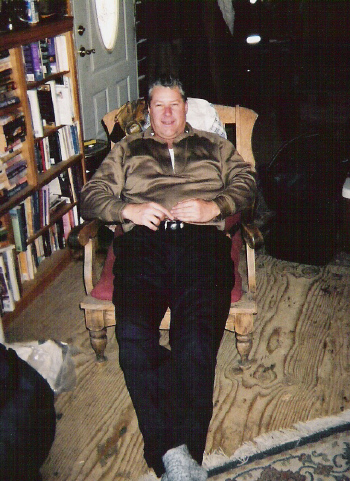 Wood was harvested from the slough above Crow Village, and David prepared an excellent steam bath for the visitors who were now in need of some personal hygiene. 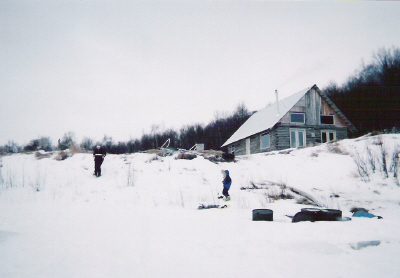 The following day, the visitors had to return to Anchorage, but vowed to return in the future for more adventure Below are some pictures from the adventure. I hope you enjoy them.